Sunday's are about spending time with your friends and family. Enjoying your time together without distractions and with excellent food and drinks. We are very proud of your Sunday menu and we look forward to seeing you soon. Spanish chorizo, Italian salami Milano, prosciutto di Parma ham with caramelised onion chutney, freshly baked artisan breads, sunblush tomatoes (and marinated olives). All our meats are hand-carved and served with homemade garlic & rosemary roasties, cauliflower cheese, Yorkshire pudding, red wine gravy and a medley of seasonal vegetables. Slow-roasted, tender beef sirloin served pink with roasted parsnips and horseradish. Served with homemade apple sauce. Boned and rolled, slow-cooked and served with sage & onion stuffing. 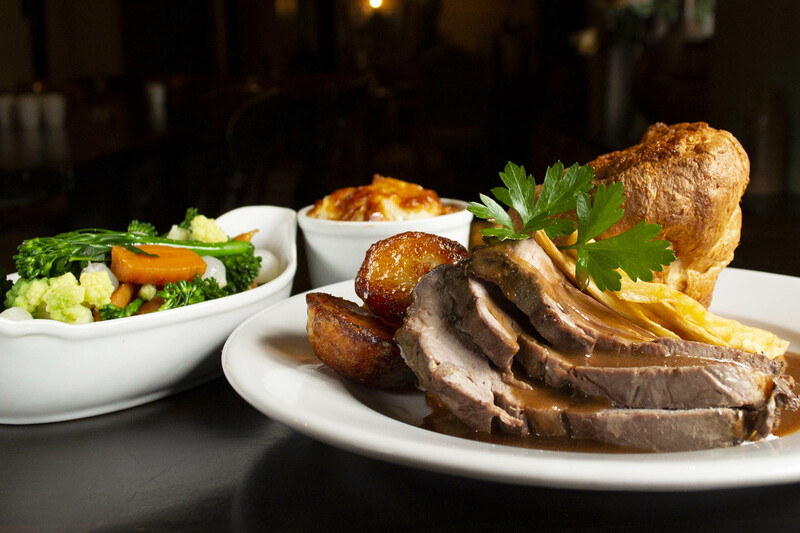 Same great roast but with your choice of two or more meats from our selection. Slow-cooked lamb served pink with mint sauce. Oats, nuts, mushrooms and herbs wrapped in crispy filo pastry served with a vegetable shallot gravy, roasted parsnips, cranberry sauce and stuffing. Handmade beef & herb meatballs served on a nest of basil linguini pasta, with a rich tomato sauce & finished with shaved parmesan & micro basil. Centred with chilli jam, coated in crispy panko crumb served on wilted greens. Crisp choux pastry filled with salted caramel cream & drizzled with hot chocolate sauce. Warm and gooey chocolate brownie made with white and dark chocolate garnished with caramel candies served with refreshing vanilla pod ice cream. Delicious sponge steeped in a sharp orange syrup served with clotted cream.